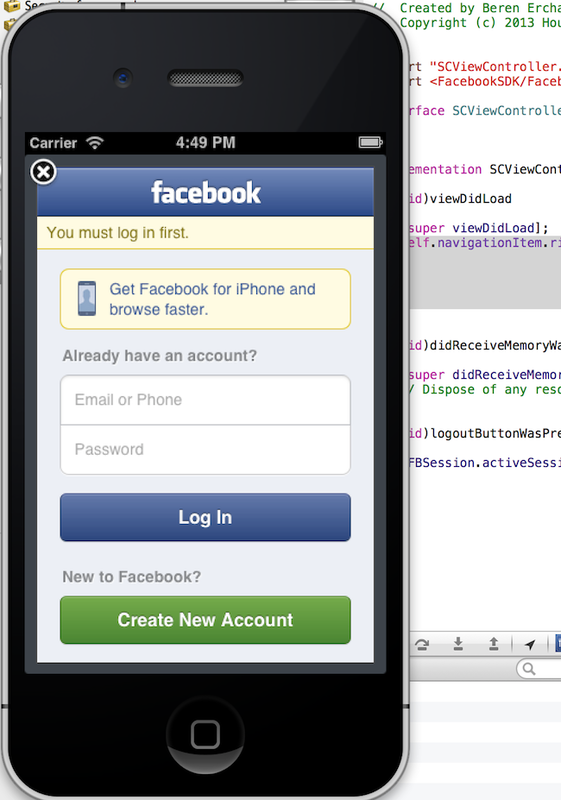 Recently I decided to mess around with the Facebook iOS SDK. I’m not really sure what I want to do with it yet, but when I started running thru the instructions and hopping back and forth between their various samples I started getting confused. Some of the tutorials are a bit out of step with each other – perfect opportunity for a blog page. I’m not really sure at this point, but I was thinking about a hybrid app that could combine my blog feed with my social feed from facebook. Some concept like this to interweave things. 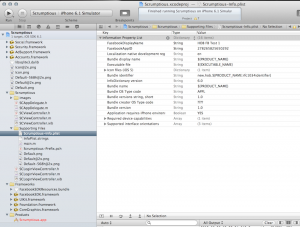 Just an idea…I’ll be developing all this on my Macbook Pro with latest iOS 6 based tools. If this comes out nice I’ll also build an Android version. developer.facebook.com: main developer page where you create appIds and can get access to all the docs for the various SDKs. developers.facebook.com/docs/getting-started/facebook-sdk-for-ios/ : definitely the starting place and all the other tutorials assume you have memorized this one. Basically you need to ignore alot of the initial setup in the other tutorials and follow this one, for example the Scrumptious tutorial does not cover where to add a Facebook appId or even that this needs to be done. 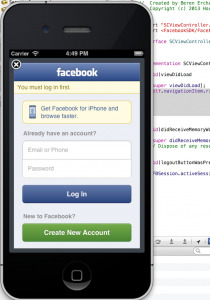 developers.facebook.com/docs/tutorials/ios-sdk-tutorial/ : Main tutorial that covers most things. Its really a pretty good tutorial. Seems trivial – but the directions could be a bit clearer for how to set things up. First act is to download the sdk and extract is somewhere on your machine. Following the direction, add the framework (FacebookSDK.framework) to your Xcode project by literally dragging and dropping the folder on the frameworks folder in your project. The next step is to create an appId and add this to the property keys in your project’s .plist file. When creating your app on the Facebook site you don’t really need to have final values for the strings like appName and stuff. appID has to be legit tho. to the implementation file and then you’ll see the connections in the builder to complete the wiring. Step 2c also has you add a function called openSession to the app delegate. This function includes the mysterious “^” operator – what’s that? Its a block declaration operator. 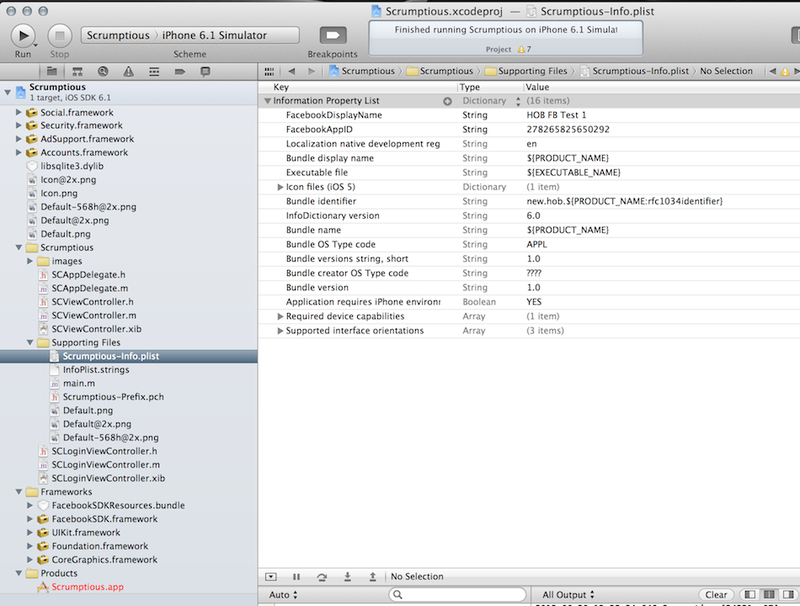 Check carefully the trailing “:” on the action event that essentially tells the runtime to pass id the ID of the sender. If you miss that you’ll get the dreaded “can’t find the stinking selector…” error. With that done I’ve got login and logout working properly. The tutorial is pretty straightforward – its just the little things. 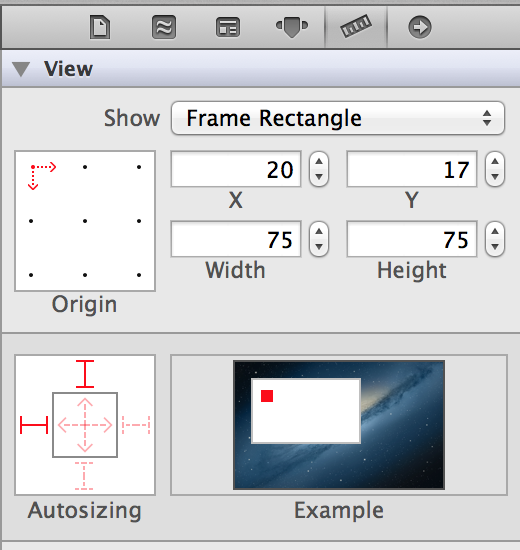 Like why not use interface builder consistently or not…so the nav button work should have been done in IB I think. With login’s in hand – now what? Well let’s start with the basics – and keep trailing the tutorial I guess. Pictures and some basics for the account. Well starting with adding the picture you get yet again some vague instructions to “wire up” stuff. Ok – here’s the deal: add the two properties to SCViewController for the picture and image. Then go into IB. 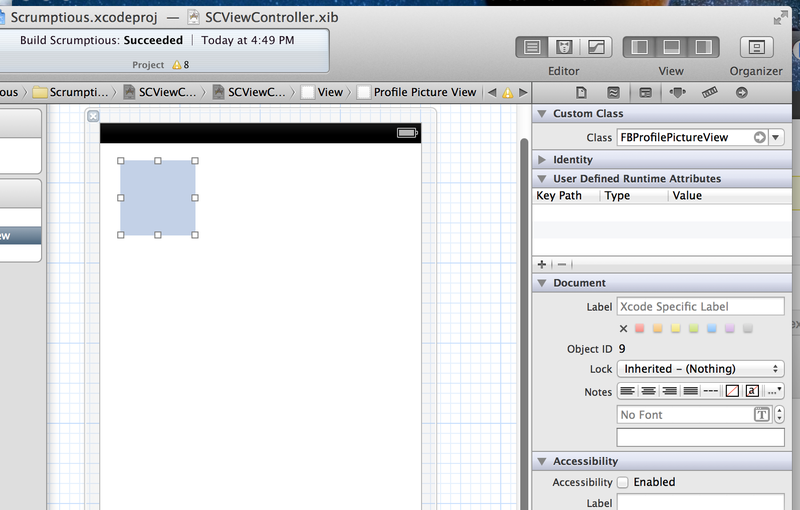 Add a UIView and set the properties as described and add the label too. You’ll be able to wire the label to the string property – no problem. To add the outlet property to the image you first have to adjust the class of the view – set it to FBPictureProfileView and then you can make the connection through the File’s Owner. When in doubt reset the stupid monkey assed simulator.